Last week we experienced some lovely fall weather. I was driving when the storm clouds parted to let the sun light up a rapeseed field. I stopped the car at the next safe opportunity and ran out with my camera before the light changed again. 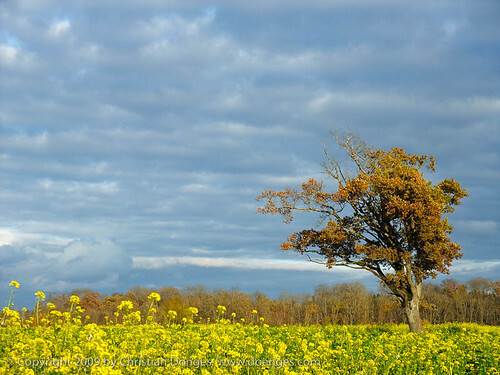 It turned out that the weather stayed like this for a few minutes more than I anticipated and it was on the way back that I got the best images of the oak tree with the orange leaves in the bright yellow and green rapeseed field. Much to my chagrin, I was only carrying a JPEG-only tiny compact camera. This really shows at larger print sizes, but for online viewing it is a moot point.